An undead behemoth seemingly impervious to even the most potent magic, this starving abomination roams inside bakonawa's lair and take it over, continually in search of unwary prey. It is said his victims catch only a glimpse of his monstrous frame as they are dragged them through the shadows, bleeding profusely as a jagged hook etches deeper in their flesh. Wails of agony echo in the distance, only to be drowned out by the Butcher's maniacal laughter as he severs their limp bodies with his great maw. Unspeakable horrors ensue in a deathly silence, a dreadful omen for what is to come. 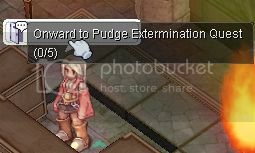 THis Quest has 6 Parts , I will Guide you up Until you can Revive Pudge. you are in "Hyrule" and all party members inside the Airship will be warped automatically in Hyrule.. B.--Lets Meet Anne Curtis at Hyrule! Note* This is a One time Pay Only, If your Character is Already Paid, she will let you Warp without the requirements anymore! Once You Acquire all this Requirements, talk to her and You can now have an Unlimited Access for Anne Curtis in that Character when doing the Quest again. Note: When Entering, I Recommend that your whole Party must be all paid 1st before Entering, why? because is one of the members is not paid, he/she will never be warped inside the Dungeon. and your Party is Ruined. C.--Six Paths of Pain Dungeon! After talking to Anne Curtis, she will warp you inside this Dungeon..
You must Clear all the Monsters named " Pudge Minions " in Each Room ^^. The Looter "MUST SHARE" the 5pcs to its party members for them to be able to warp to Pudge Lair. If you Have all this, you can now Revive Pudge. "Pudge: Who Dares awaken me?!" after that, All players in that Map will be warped into another place where Pudge is..
After Killing Pudge, All players in that map will be warp back to Prontera, and Must wait 24hours before Reviving Pudge Again. sir brice anung prize once napatay na namin si pudge??. Parang matatagalan hehe dahil dun sa di active na " Battle Grounds ".